Today's art scene is highly populated with graffiti artists showcasing their work all over the downtown streets. Our St. Catharines culture is incredibly creative and expressive, with artists who are bold and unique. There is no doubt that creatives are what keep us fresh and innovative. While we value, respect, and understand the beauty behind great artwork, we also understand that there is a distinction between art and vandalism. While that distinction is yours to make, we are happy to offer coatings that allow easy wipe-away, so you can keep your investment looking brand new - whether it be on your house, government offices, public parks and recreation centres, doors and window trims, and sublimation projects like this. Here at Decora we offer anti-graffiti coating on painting and sublimation projects, which means your custom pieces can be anti-graffiti too! The non-stick surface repels graffiti from paint, paint spray cans and permanent markers. It's important to remember that accidents happen. If we can't prevent them, we can still handle them. 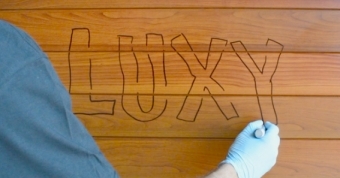 With the use of our own cleaner, we demonstrated below how to effectively remove graffiti from our LUXYCLAD® siding. This ensures our customers that in the event of vandalism, there is no need to hire someone to remove it, and there is no need to spend money on replacing and re-installing our siding or soffit. For siding and soffit specifically, our division of Decora, called LUXYCLAD®, uses the same powder coating and sublimation process. Luxyclad: Anti-Graffiti Demonstration from LUXYCLAD on Vimeo.